So it’s the Easter weekend and how many bunny eggs have u found ? or try to hide away and keep ’em all to yourself? lol. When I was in Sydney, the best part of Easter was the actually the day after. Cause all Easter eggs are 50% LOL.. Well u can’t blame a student for trying to find the cheapest way to shop. 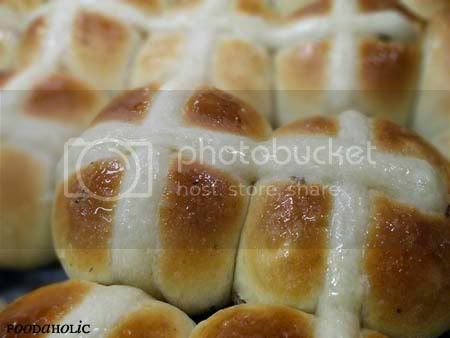 I remembered these hot cross buns that I made way way way back in Sydney (counting, 3 + years already :() and decided to excerpt it and blog for the occasion. PS the photos tagged foodaholic cause I used to blog there. 1. Soak sulatnas and raisins in hot water to eliminate dirt and soften it. Mix flour, sugar, yeast, salt, milk powder and fat into the mixing bowl till slightly crumbly. 2. Add in eggs and let it mix. Slowly add in water but don’t add all at one time. Check the consistency of the dough to decide the amount of water. 3. If it’s dry and not stickying together, add in a lil more water. If the dough is sticky on the outside but dry on the inside, mix it for about 4-5 more minutes on the machine. If dough is sloppy, too much water is added, and thus, you might need to add in flour. 4.When the consistency of dough is achieved, add in the drained sultanas, raisins and mixed peels, and the spices. Let it ferment for about 30 minutes then knock the air out and shape them into round balls at 60g each. 5. Place them on trays and let it prove for about 30 minutes or till double in size. Then make the Cross mixture. 1. Mix all till well combined, about 5 minutes. Pour mixture into piping bag and pipe crosses on the buns. 6 Comments on Happy Easter! 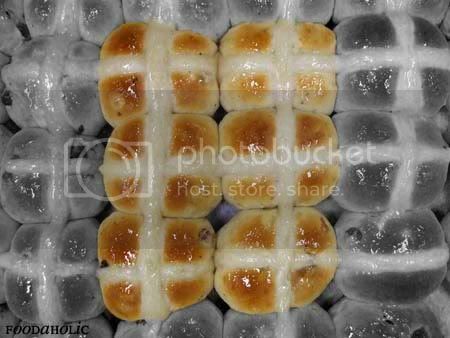 Happy Easter Swee San and the hot cross buns looks yummy! You are good! I might have to make some even after Easter! Great looking buns! Happy Easter! Your hot cross buns look really good! Your hot-cross buns look incredibly scrumptious! Hope you had a fab Easter weekend!